Offering a terrace and views of the mountain, Sapar Deluxe is located in Almaty. Free WiFi is featured throughout the property and free secured parking is available. Albay Metro Station is within a 25-minute walk of the hotel, and Fantasy World theme park is a 15-minute drive of the property. All air-conditioned rooms come with a flat-screen TV with cable channels. The private bathrooms are fitted with a shower and a bidet. For your comfort, you will find free toiletries and a hairdryer. Guests can enjoy the on-site restaurant and bar. You will find business facilities and a 24-hour front desk at the property. Medeo is 4.3 miles from Sapar Deluxe, while Shymbulak is 12.4 miles away. 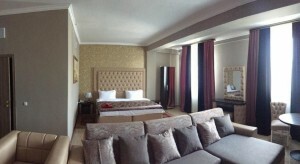 The nearest airport is Almaty International Airport, within a 25-minute drive of the property.